The recent investigation report about the accident that killed Paul Walker in his friend’s Porsche Carrera GT indicates that, the 93mph speed before the crashing (the speed limit of that road is 45mph) is one of the major factors. Also, the 9-year old tires installed on the car is another contributing factor. The Porsche Carrera GT is a limited edition production car which is sold in the US market for around 2 years. The car was discontinued in 2006 due to the reason that it did not meet the latest US airbag regulations. In 2006 US airbag federal regulations, each car model sold in US is required to have dual stage airbags installed. Which means for each airbag installed in the car, it needs to have a sensor to detect the severity of the impact, and the airbag should be deployed in different forces for different impact severity. According to Porsche’s documents, the airbag on the Carrera GT is only single stage and Porsche consider the cost of making modification to the airbag system is not profitable, they would rather simply stop producing the car instead. This leaves our one question: whether an old supercar is still safe when compared to today’s latest safety standards? YouWheel.com editor browsed various crash testing organizations records, for example IIHS, NHTSA, Euro NCAP. 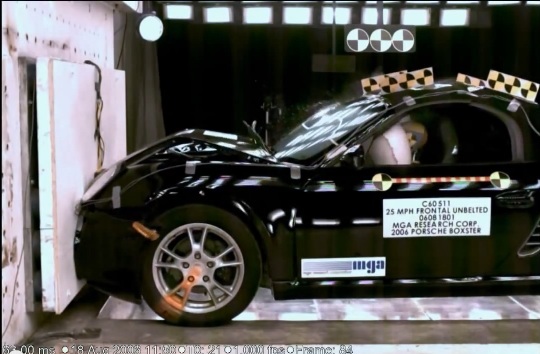 The only test found at this time is the 2006 Boxster Convertible 25mph frontal test conducted by NHTSA, as shown in the below photo. For any other Porsche model, we do not know how it performs in crash, how solid is its safety cage, how well it can protect its occupants. One reason that government organizations do not test Porsche products is due to the cost of the vehicles, since in many consumers’ mindset, Porsche means expensive and high price. But some Porsche cars are actually not that expensive. For example the 2014 Porsche Boxster’s base MSRP is $51,400, the 2014 Porsche Cayenne carries a MSRP of $49,600 only, the 2014 Cayman is just a little bit more expensive than the Boxster, at $52,600. All these are traditional Porsche models that have been in the market for many years. On the other hand, IIHS has already tested the 2014 Maserati Ghibli, which holds a base MSRP of $66,900. Even the much more expensive Maserati Ghibli is fully tested, why are the much cheaper Porsche vehicles still not tested and have data that can be compared to other cars? We hope the US and European government organizations test more Porsche vehicles in the future, especially the “cheaper” ones. In VW’s 2013 financial report, Porsche enjoys an operating profit margin of 18% (it earns approx. $23,200 each car sold on average). As a consumer, it is reasonable that we put more scrutiny on high profit margin products, exercise our due diligence when buying cars.